Community Health Fair in Mechanicsville 2/23! We wanted to invite you all out to the Community Health Fair in Mechanicsville! WestCare Georgia’s Youth Community Builders (@YouthCommunityBuilders on Instagram) is a youth leadership program in the Mechanicsville community that aims to service and support youth in NPU V! We will be at Dunbar Rec from 11 am to 3 pm next Saturday the 23rd! Please share the flyer and if you share on social media, tag us! 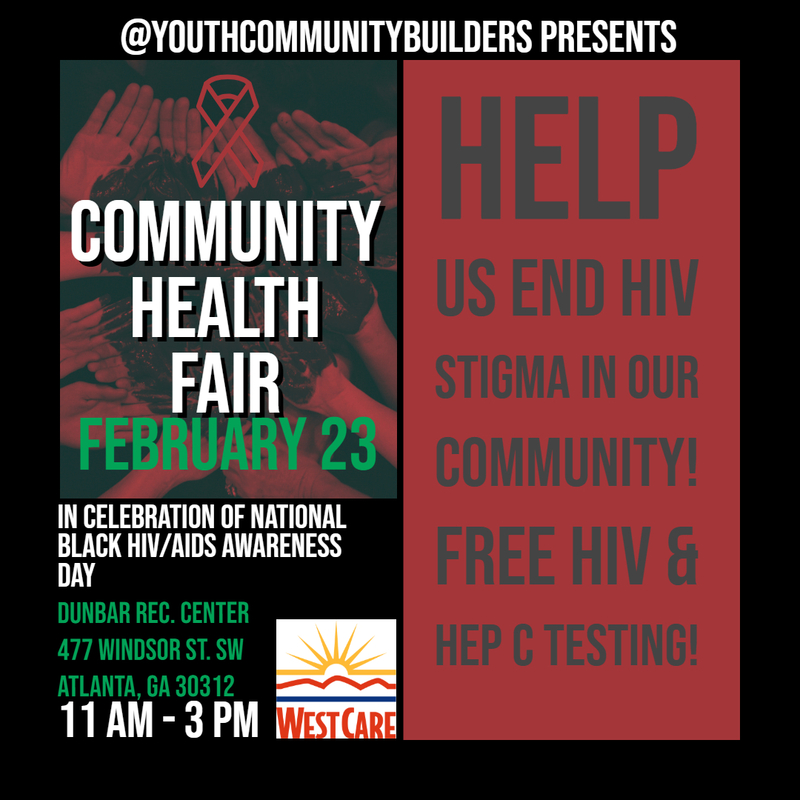 We really want the youth to feel their efforts to put the health fair together are supported by the community they are serving! Author adminPosted on February 17, 2019 Leave a comment on Community Health Fair in Mechanicsville 2/23! We will be planning these events monthly to assess our progress and or regress and to make sure that everyone is up for the type of work that we engage in. I really look forward to seeing you all in the same place once again to catch up and have some real discussion on keeping NPU-V safe and keeping residents and community stakeholders in a healthy mental health space. We also have our reoccurring Healing circles happening at Metropolitan library. I would love for you to possibly identify date to attend and bring someone with you to engage in some positive healing. With that said, we will meet o n February 27th at 530 pm at 656 sports Bar and Grill located at 656 Pryor St SW, Atlanta, GA 30312. Big shots out to Major Murphy and Ms Luster for swinging through last month!!! We will need RSVP so we can identify how much food to plan for. Again, I look forward to seeing everyone. TALES Production LLC will be filming scenes for an upcoming TV movie entitled, “Tales,” at 555 Whitehall St. Atlanta GA 30303. Filming is scheduled to start on Feb.14 -15, 2019. We will work completely on the business property. There will be trucks parked on Whitehall St for equipment. To ensure the safety of the public, cast and crewmembers, we have requested a permit and police presence from the City of Atlanta. We are sensitive to the impact that filming can have on the daily operations of a residential/business district. Several off-duty City of Atlanta Police Officers will be onsite during our time at the location to ensure the successful flow of traffic through the area. All equipment and support trucks will be parked within our closure to avoid any unnecessary congestion. It is with these issues in mind that we approach the logistical needs of the production, so we can effectively work to minimize any inconveniences to those in the area. On behalf of TALES Production LLC, I thank you for your patience and cooperation; it is greatly appreciated. If you have any questions, comments or concerns, you can reach me at the number or email address below. 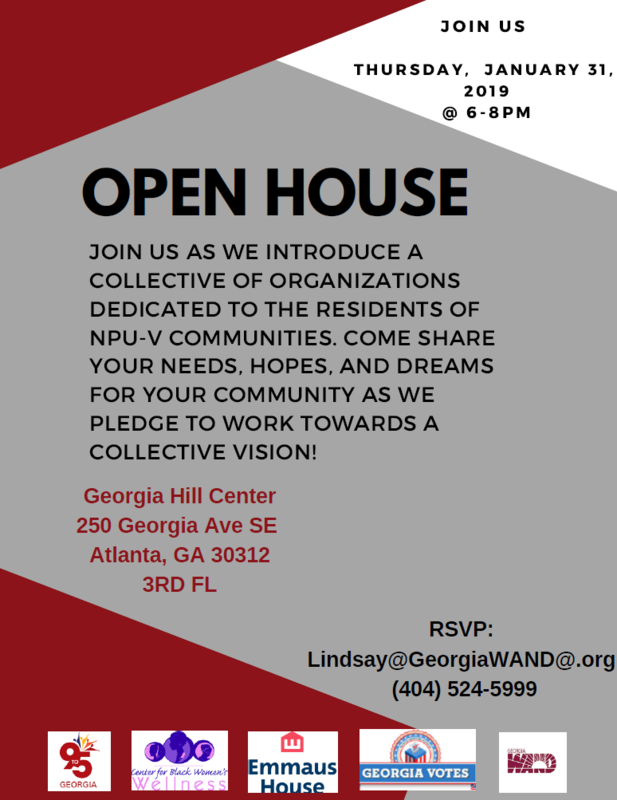 Georgia WAND Open House This Thursday! As a follow up to last month’s NPU-V Community Forum, please join us as we introduce a collective of organizations dedicated to the residents of NPU-V communities. Come share your needs, hopes, and dreams for your community as we pledge to work towards a collective vision! Author adminPosted on January 30, 2019 Leave a comment on Georgia WAND Open House This Thursday! Filming at Garibaldi St., Stephens St., and Windsor St.
Production Short synopsis: Amazing Stories is a reboot of the 1980’s Emmy award winning television series. On Monday February 4 2019, PUGET SOUND television series will be filming scenes for a new anthology-based series in your neighborhood. We will be filming exterior and interiors of a scenes at a residence located on Garibaldi Street between Stephens St. SW and Bass St SW. From about 9am 2/4/19 to 6am 2/5/19. Our Prep and Wrap days are scheduled for Friday February 1 and Saturday February 2 2019. EMERGENCY NO PARKING SIGNS will be posted. enforced by police officers. 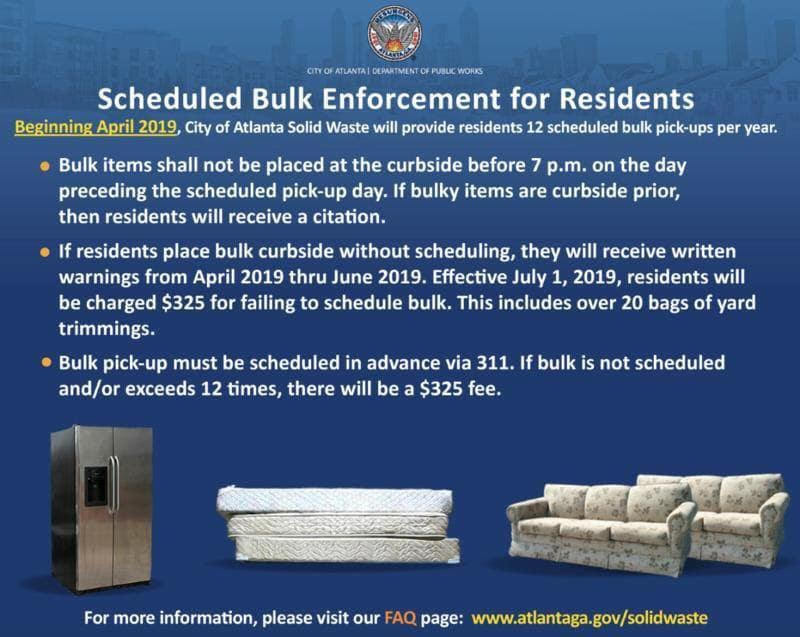 Residents and Emergency vehicles will not be impeded. If you have any questions or concerns, please don’t hesitate to call. Author adminPosted on January 30, 2019 Leave a comment on Filming at Garibaldi St., Stephens St., and Windsor St.
Garden Films Productions, LLC will be filming from Tuesday, January 29th until Friday, February 1st (from approximately 7:00 am until 7:00 pm, but going later in the evening on Friday) at C&L Used Auto Company, 570 Glenn St SW, Atlanta, GA 30312. Prep work will take place from Tuesday, January 22nd until Monday, January 28th. We will strike at this location from Monday, February 4th until Wednesday, February 6th. Please note: in addition to our lane closure, the scenes being filmed will also involve simulated gunfire. With such, there will be popping sounds heard nearby but there is no reason to be alarmed. We are sensitive to the impact that filming can have on the daily operations of a business district. Our production staff and off-duty APD officers will be on duty during our time here to ensure safety and the successful flow of traffic through the area. We will also work to minimize the inconveniences to those nearby. On behalf of Garden Films Productions, LLC, we thank you for your patience and cooperation; it is greatly appreciated! If you have any questions, comments, or concerns, you can reach us at the production office at (404) 996-0616. The Fulton County Library System will hold a second round of public meetings, beginning February 4, 2019, to share design plans and details about the upcoming renovation of five libraries, including: Mechanicsville, Buckhead, Northside, Northeast/Spruill Oaks and Ocee Libraries. The meetings will include a presentation of design concepts by the Design/Build team of Evergreen Construction and McAfee3 Architects. Each meeting will be an opportunity for residents to ask questions about the renovation process, share comments about the new designs and learn about expected closing dates. This will be the last public meeting held for libraries in Group 2 before construction begins. All meetings will take place from 6:30 – 8:00 p.m. For more information and exact location information, visit www.afpls.org. 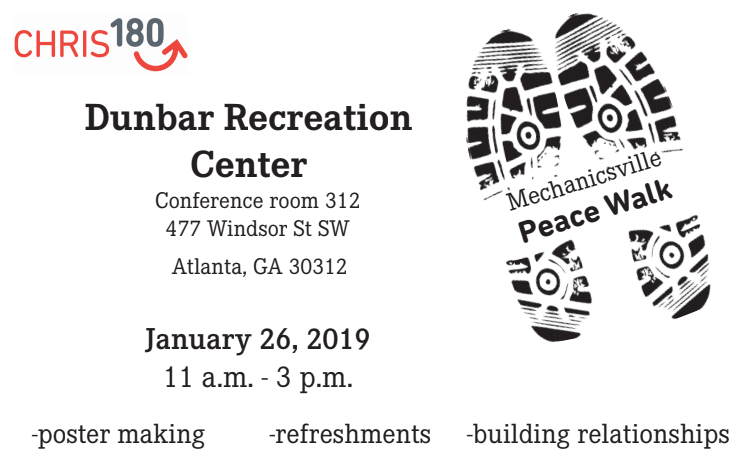 CHRIS 180 is hosting a Mechanicsville community peace walk in response to some of the challenges our community has seen with regards to crime and acts of violence prior to the New Year. This is an opportunity to build stronger relationships and pour back into the cup of the community in which we all love–Mechanicsville! Bring a friend with you while we create posters of peace and positive affirmation, eat, and then canvas the community. If you have any questions, please contact Alfred L. Garner II MSW at 470-218-7037 or alfred.garner@chris180.org.